In 1969 Mark Donohue, driving a Lola T70, beat a flock of Porsches to win the Daytona 24 Hours. 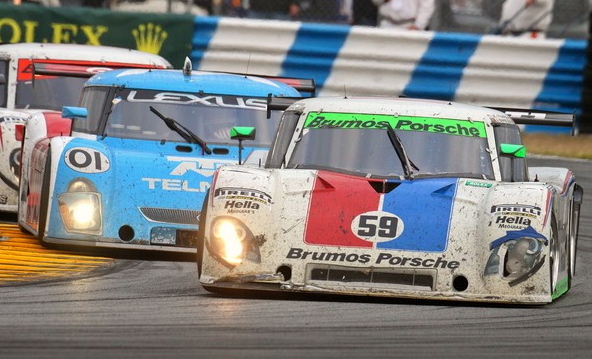 Yesterday his son David Donohue, in a Porsche powered car, passed two time winner Juan Pablo Montoya with less than an hour to go and managed to the Colombian at bay and win one of the closest and most exciting Daytona 24s ever. Like one of our readers said, the cars may look like Darth Vader helmets with wheels but the racing sure was exciting! Nice to see Brumos win. They're our local Porsche dealer and it's cool to go into the showroom where they sometimes keep their old racers on display. When I went to look at a Cayman one Saturday, it happened to be a race day and all of the sales reps were gathered around the TV cheering their team on, nice to see dealers that still have a strong involvement in motorsport. NIce, maybe they'll d a Daytona special edition Cayman with blue and red stripes! This victory made me go kiss my copy of "Unfair Advantage".